The film was nominated for three Academy Awards (including Best Picture and Best Director), and won Best Cinematography (Lee Garmes). It became Dietrich's biggest US box-office hit, taking in a record amount of $3.7 million for Paramount. It was remade as Night Plane from Chungking (1943) and as Peking Express (1951). In the opening scene, a train is being boarded and loaded with baggage at the bustling Peking Railroad Station. It is traveling from Peiping (Peking) to Shanghai as a civil war rages through war-torn China. One of the passengers, an Eurasian merchant named Henry Chang (Warner Oland), offhandedly comments: "You're in China now, sir, where time and life have no value," as the train pauses to remove a cow from the tracks. Shanghai Lily: Well, doctor, I haven't seen you in a long time. (They shake hands). You haven't changed at all, doctor. Shanghai Lily: Have I, Doc? Do you mind me calling you Doc, or must I be more respectful? Dr. Harvey: You never were respectful, and you always did call me Doc. I didn't think I'd ever run into you again. Shanghai Lily: Have you thought of me much, Doc? Dr. Harvey: Let's see. Exactly how long has it been. Shanghai Lily: Five years and four weeks. Dr. Harvey: Well, for five years and four weeks, I've heard of nothing else. Shanghai Lily: You were always polite, Doc. You haven't changed a bit. Dr. Harvey: You have, Magdalen. You've changed a lot. Shanghai Lily: Have I lost my look? Dr. Harvey: No, you're more beautiful than ever. Shanghai Lily: How have I changed? Dr. Harvey: You know, I wish I could describe it. Shanghai Lily: Well, Doc, I've changed my name. Shanghai Lily: No. It took more than one man to change my name to Shanghai Lily. Dr. Harvey: So you're Shanghai Lily. Shanghai Lily: The notorious White Flower of China. You've heard of me, and you always believe what you've heard. Dr. Harvey: And I still do. You see, I haven't changed at all. You interest me, Mr. Carmichael. I'm not exactly irreligous, but , being a physician, I sometimes wonder how a man like you can locate a soul and, having located it, diagnose its condition as rotten. 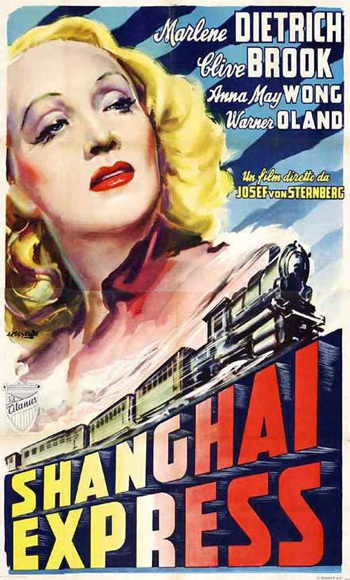 Traveling on the train is a mysterious Eurasian merchant named Henry Chang (Warner Oland), in actuality a warlord rebel leader, who has his rebels ambush and attack the train at midnight. He is angered over the arrest of one of his top aides during the trip. He takes hostages, including Captain Harvey as his prized ransom, planning a prisoner exchange. Chang also offers Shanghai Lily to join him at his palace in the interior of China as his mistress, but she refuses, citing that she is "reformed". Captain Harvey punches Chang in the face to defend her, and is then threatened with being blinded. Chang also rapes American-bred Chinese prostitute, Hui Fei (Anna May Wong), a 'coaster' prostitute like Shanghai Lily, and keeps her imprisoned. Unbeknownst to the doctor, Shanghai Lily offers and sacrifices herself to the warlord to insure Harvey's release. She offers her "word of honor" - and decides of her own "free will" to accompany Chang. Wronged Hui Fei, angry over being raped earlier by the rebel leader, stabs him to death in the back, fortuitously freeing the Shanghai Express and all the captives to continue their journey - with arrival four hours late in Shanghai. After their arrival, Reverend Carmichael is unable to convince Dr. Harvey of Shanghai Lily's good intentions in offering herself to go with the warlord, even when he vowed that she prayed all night for his release. However, when Lily presents Harvey with a replacement watch, he finally relents - and the film closes on their embrace and kiss on the station platform.